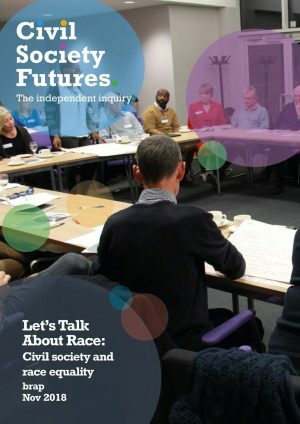 The Inquiry into the Future of Civil Society (Civil Society Futures) reports on its conclusions today. 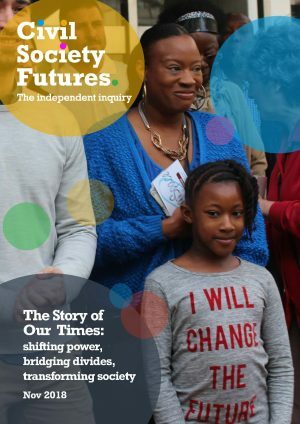 The Inquiry was a two-year project funded by independent foundations to explore the future shape and role of civil society in England. how civil society is organised. It proposes a shared PACT for civil society, involving shifting power, greater accountability, closer connections with the people it serves and improving trust. The Inquiry was funded by the Baring Foundation, Barrow Cadbury Trust, Calouste Gulbenkian Foundation (UK), City Bridge Trust, Esmée Fairbairn Foundation, Lankelly Chase, Lloyds Bank Foundation for England and Wales and Paul Hamlyn Foundation. NCVO supported research by the Inquiry. 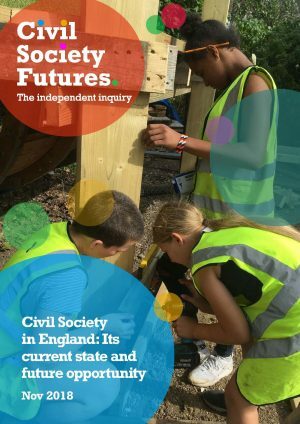 To hear more about the Inquiry’s findings, visit www.civilsocietyfutures.org or follow #civilsocietyfutures over the next two days. Let’s talk about race: civil society and race equality, which was produced for the Inquiry by brap. Examines civil society engagement with race and race inequality.